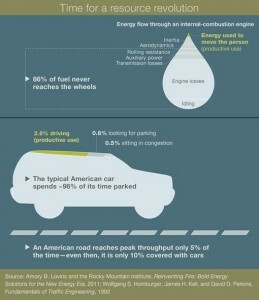 The average car spends more than 95 percent of its time …. doing nothing. Less than 40 percent of electrical transmission capacity is in use at any given time. A calorie of beef requires 160 times more energy to produce than one of corn—and as the world grows richer, more people eat beef. The cost of bringing an oil well online has more than tripled over the last decade. A Motorway operating at peak throughput is less than 10 percent covered with cars. Phnom Penh has a lower water leakage rate than London. There used to be a very small detached house just inside Pamber Forest which I used to pass daily, and often wondered whether I could live quite happily in such a small place. Not quite as extreme as the Capsule Hotels you find in some areas of Japan, but a step in that direction nonetheless. This would probably mean quite a ruthless clean of the miscellaneous stuff we have all over the current house, but i’m sure there would be impressive efficiencies if we knuckled down to it. The good thing about looking at stats like this is to start having thoughts of what Larry Page (CEO of Google) terms “Moonshots“. What could be done to improve things 10x, 100x or 1000x better than is considered normal by the rest of us, and what changes will that lead us to. by McKinsey’s Stefan Heck and Matt Rogers. I purchased was an excellent 27 page read. In terms of manufacturing (I guess they must be manufacturing consultants by day), they suggest looking at five areas: substitution (replacing costly, clunky, or scarce materials with cheaper, better ones); optimization (using IT to improve the production and use of resources – to order rather than into stock? ); virtualization (which must really mean sweating otherwise idle assets? ); circularity (finding value in products after their initial use) and waste elimination. However, then then start citing “having to deal with more complex supply chains”, while integrating “big data” (hmmm – fad alert!) and finding diverse talent with new skills in areas like software- and system-integration (while I thought those were pretty well established!). Looks an interesting book nonetheless, and i’m sure some good nuggets to pick at. Duly added to my Wish List.